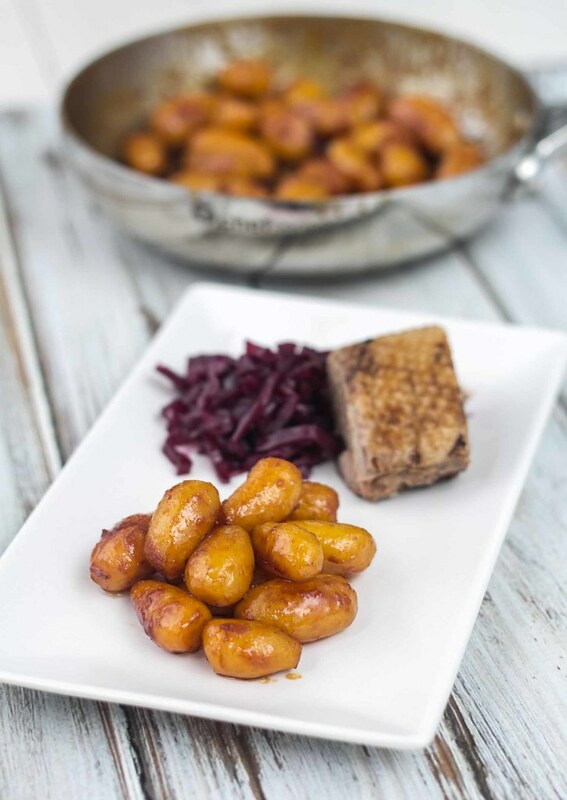 Nordic sugar browned potatoes. These potatoes are often served during the Christmas time. Perfect together with a Nordic roasted duct. In Denmark, and the Nordic countries in general, the 24th of December is a day which is packed with many great traditions. The 24th of December is the day where we get together with our family, eat a lot of delicious food, exchange presents and celebrate Christmas. 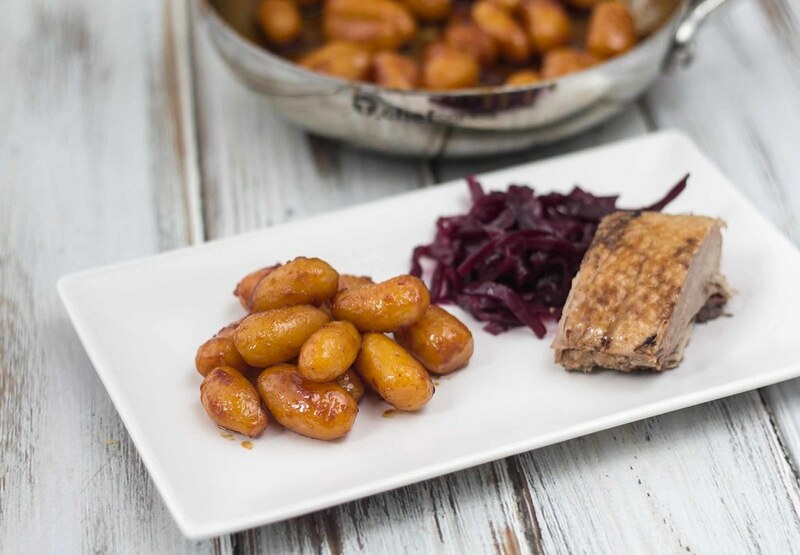 A typical Danish Christmas eve dinner consist of roasted duck or roasted pork, served with Danish red cabbage, boiled potatoes and these sugar browned potatoes. For dessert it’s a big tradition to serve the Danish rice pudding (Risalamande). Sugar browned potatoes is, as the name applies, potatoes fried in butter and sugar so that they get a nice and delicious brown sugar coating – it’s like caramelized brown potatoes. These sugar browned potatoes can be served all year around, however, they are mostly served as a side dish for a Christmas dinner. 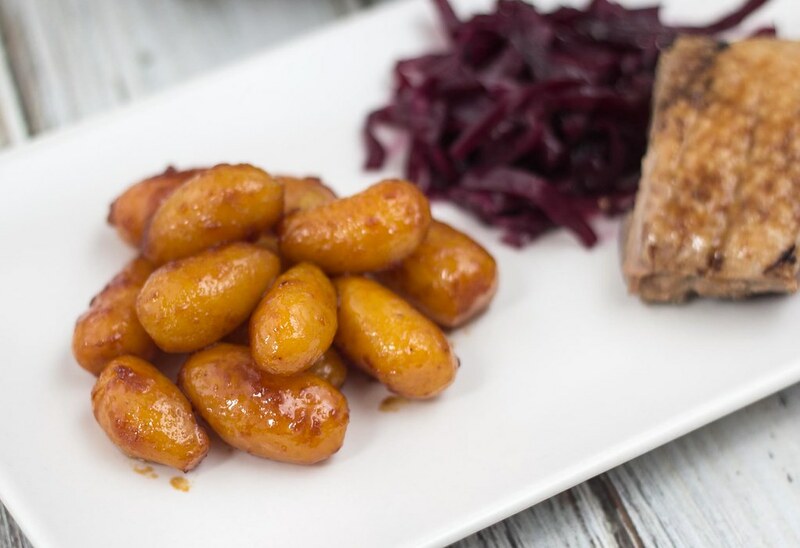 The recipe for Danish sugar browned potatoes is easy to make and very delicious. 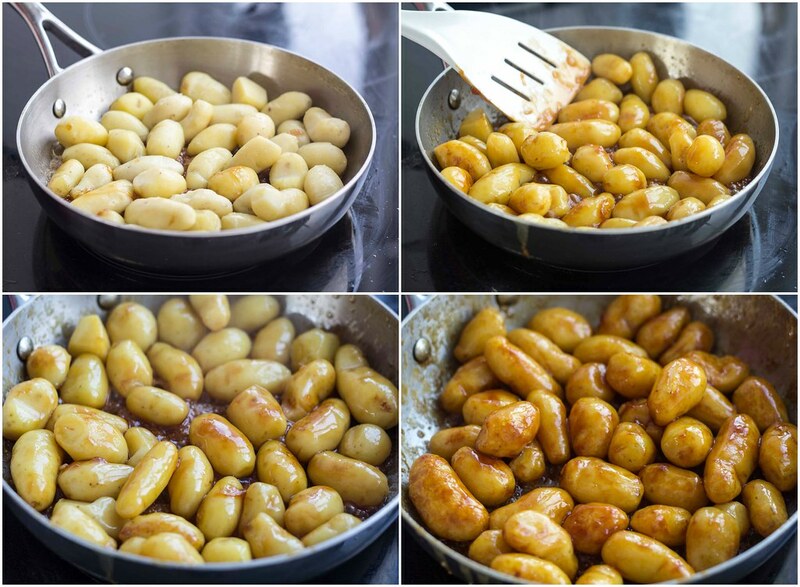 The recipe is simple – the small baby potatoes are boiled and fried in melted sugar and butter on a hot frying pan. The potatoes get very shiny, sticky and super delicious. You can with advantage boil and peel the potatoes the day in advance and then just fry them just before they are to be served – this will save you a lot of time on the busy day of Christmas eve. 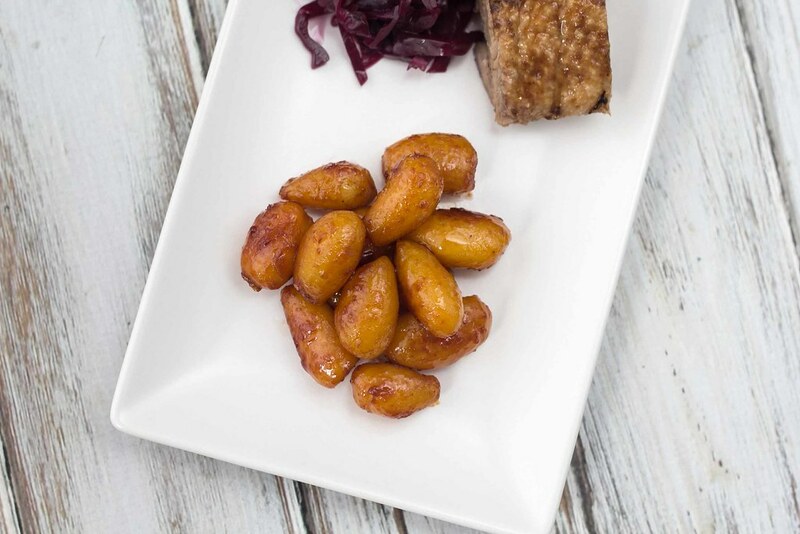 In Denmark you can buy already boiled and peeled potatoes on glass jars – we will absolutely not recommend buying these prepared potatoes. We always buy a bag of fresh potatoes, boil and peel them ourselves – they simple just have a much better taste and consistency. If you are interesting in other traditional Danish Christmas recipes you can take a look at our recipe archive. Clean the potatoes but leave the peel on. Boil the potatoes in lightly salted water for about 15 minutes. Don't boil them too soft. Peel the potatoes using a knife. Let the potatoes cool off before you proceed. You can with advantage do this the day before you actually need the browned potatoes. 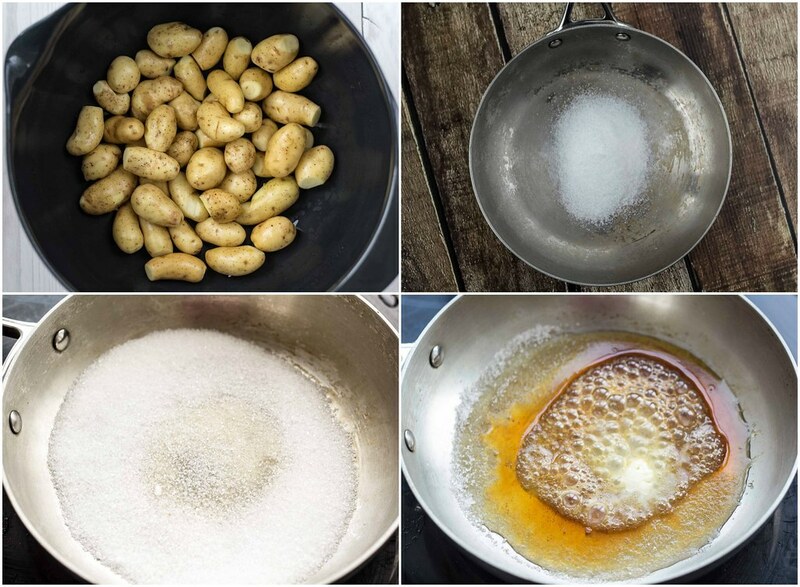 Pour the sugar in an even layer on a cold frying pan. Turn on the stove at medium heat and let the sugar melt without stirring in it. Try to avoid using a frying pan with Teflon coating. When the sugar is melted add the butter to the pan and turn up to high heat. Add the potatoes to the sugar/butter mixture. Fry the potatoes in the sugar/butter mixture for about 5-7 minutes. Turn the potatoes constantly. If you are making these potatoes for your Christmas dinner and you have some extra duck grease - then add 1 dl (1/2 cup) of the grease to the pan with the potatoes. This will give the potatoes a great taste and a nice look. When the sugar is sticking evenly to the potatoes they are done. Found your site today, saw this recipe, and knew I had to try it. So delicious, we had it with roasted chicken and sauerkraut, which cut the sweetness nicely. I was so happy to discover your site while looking for the Christmas rice pudding with cherry sauce. My husband was born in Randers and I have enjoyed the traditional Danish Christmas dinner for many years. My husbands parents have both passed and unfortunately my mother in laws handwriten (in danish) cookbook could not be found. I had some of her recipes but was missing a few. I will be making both the risalamande and the browned potatoes this Christmas Eve! I’m so glad you found our site and can use our christmas recipes – we love all the great christmas food here in Denmark :-) Happy Christmas to you! My father went to school in Randers,but he lived in a small village called lime ( pronounced Lima) he sold mushrooms to the chef at the hotel Randers for extra money as a kid ( called champions ). I’ve been going through my mothers recipe box, and I’m going to make Frikadellar & red cabbage tonight! Hint.. You can use the rendered fat from bacon in the red cabbage, not too much. Thanks …. you are a life saver, have it in Danish but with a sick Dane … it is hard to understand. Just one question; Can I do them an hour before serving and keep warm in an oven? If so at what temprature? Takk og glædelig og good jul ! Hi Margret. Yes you can make them one hour before. I would simply just keep then on low heat on the stove and stir in the potatoes from time to time. gran always made them with the peels on after boiling. I like how the bits of skin get crunchy in the browned sugar. 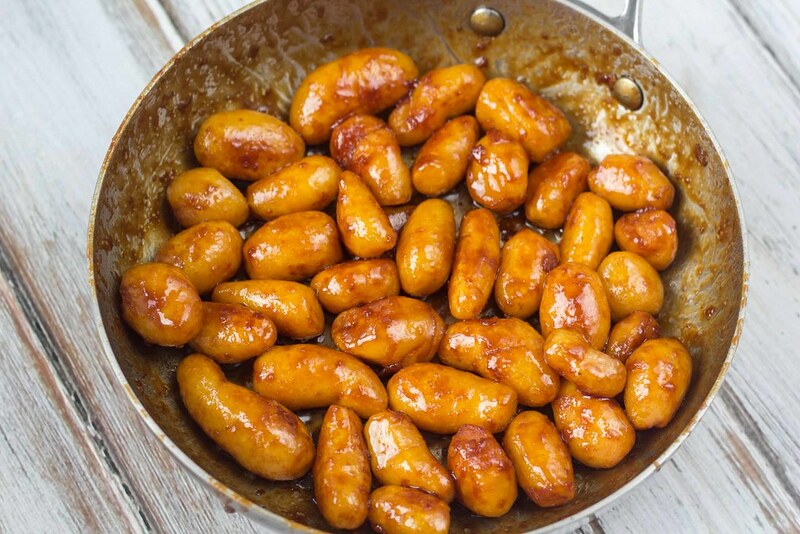 My German grandmother used to make these, but she rolled the potatoes in sugar and then fried them in the butter. They developed a candy-like shell and were delicious. The duct fat is added just after the potatoes are added.